“What are democratic rights? We don’t know anything about that”, says Mussayda, a 22-year-old resident of Tain village in Haryana’s Nuh. She has never exercised her voting rights. “It’s not that we don’t want to cast vote, but who will go through that rigmarole to get a voter card”, she says. “My husband Arif applied on my behalf, not once but twice. This one time they issued me a senior citizen card, another time my name was spelt incorrectly”, she was not allowed to vote since her details were wrong. Voting is a legal right and every eligible person must not be deprived of this right. But a huge population in India, like Mussayda, is still not registered in the electoral rolls, despite being eligible for voting because of various reasons. There have been several anecdotal reports from different states where people were not able to cast vote—a basic democratic right—because their names were missing. Lack of awareness about the voting process or a tardy enrolment process is also one of the reason why people have yet not registered or weren’t able to register themselves. “Where do we go? It’s not that we don’t want an identification card but there is so much waiting. Applying for a voter ID means long queues and never ending visits to the government offices”, she complains. However, things might be a little different this election. An initiative by Digital Empowerment Foundation (DEF) ‘No Voter Left Behind’ also known as The Missing Voters Project is an early awareness campaign aimed at ensuring that all Indian citizens who are eligible to vote make their voices heard in the 2019 general elections. As part of the campaign, an awareness camp was organised where people were educated about their voting rights. DEF has collaborated with RayLabs, a Hyderabad based technology company that has digitised electoral rolls to compare lists and identify missing families or even missing voters within families with the help of Missing Voter App. With ground staff supports team and volunteers, Missing Voter App has reached 1183 assembly constituencies, however processed data is available only for 637 as of now. According to RayLabs data, till January 29 a total of 2269 applications were filed using the database collected by the app. 1047 people are yet to be applied for due to lack of funds. The app has reported a wide reach with users present in 29 states, 422 parliamentary constituencies, over 1100 assembly constituencies and 4230 districts. Apart from ground activity, efforts were made for community mobilisation, both online and offline. Three videos of community leaders urging people to register were shot and shared on the social media. To tap potential voters, training sessions were conducted in more than 40 assembly constituencies by RayLab which was attended by over 8,000 people. DEF, as part of this No Missing Voter campaign, has been creating awareness in various states in its own capacity. 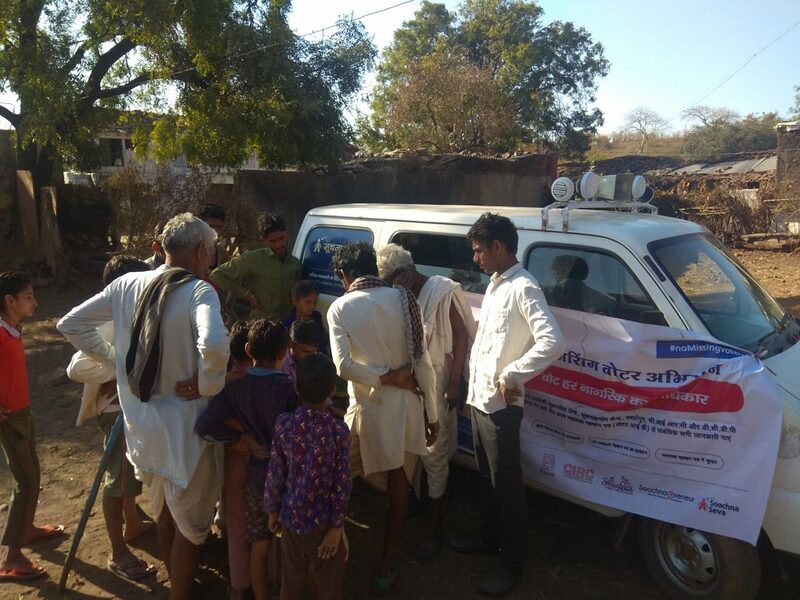 As of now, our staff working in the ground has visited three districts in Rajasthan, namely Alwar, Bharatpur and Barmer; Champaran in Bihar; Gune in Madhya Pradesh and Nuh in Haryana. A total of 735 people participated in the awareness camps, out of which 21 per cent did not have a voter ID. The team also observed that none of the participants in any of these camps knew how to apply or modify for a fresh voter identification online neither did they know to check status of their IDs. In 6 per cent of the cases, participants said that they were excluded from the voters list because they had wrong information on their ID cards. With help from the grassroots staff, DEF is creating high-impact digital awareness at all the camps above. Participants can now apply, update and check the status of their voter IDs online. It is an ongoing project and is expected to cover Barabanki in Uttar Pradesh, Kanchipuram in Tamil Nadu, Jharkhand, Uttarakhand and Odisha. DEF is also partnering with group of individuals and other organisations led by Centre for Democracy and Social Action working for the same cause. We are providing social media, technological support as well as content and graphic designs. Mussayda, now a voter card holder, is expected to cast her vote for the first time in upcoming Lok Saha elections. However, a paramount project like this needs humongous support, resources and man power. To support this campaign, click here.